many, many wonderful people – and for that, I apologize in advance. I have been given the task of summing up almost 70 years of history and purpose in the next 2 minutes. In 1949, Mike Dinin’s father, Dr. Samuel Dinin who was head of the L.A. Bureau of Jewish Education, officially began the Los Angeles Hebrew High School. The first president was Dr. Jacob Sokol and the first (and only) teacher of the 36 students was Dr. Michael Slatinsky – who later became the principal. We have taught young men and women Hebrew, how to live a meaningful Jewish life – and, perhaps, most importantly – the idea of being a Mensch in the modern world. 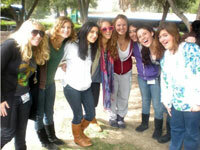 Hebrew High’s graduates include many who have served in the IDF and many who have made Aliyah to Israel. I have been honored to teach at Hebrew High for the past 17 years and I can tell you that our current students are wonderful people who will carry on the traditions and standards of Hebrew High and of the Jewish people. There are cards on the tables – that will allow you to help us. Many of our long time contributors – who helped fund the school to allow all of these great students to have had a fantastic, inspirational education – have passed away – after all the school is almost 70 years old. We need YOU to step up and fill the void – we need more scholarship and operational money. We have substantial commitments from Jesse & Stacy Sharf, Bruce Whizin, Bruce Friedman, Marvin Smotrich, Marilyn Ziering, the Farkas brothers, Ben & Janice Reznik, Karen & Michael Fried, George Farbstein and others ….However, we need a lot more to continue to produce these kind of wonderful people. Jackie and I know how important this is and have just pledged $50,000. Please take a couple of moments and fill out the card – We NEED you to make a difference in the future of our community!